LOS ANGELES - Two suspects in a stolen van led police on a dangerous chase through a southern California neighborhood Wednesday night, reports CBS Los Angeles. The van drove onto sidewalks, narrowly missed multiple cars and eventually struck a dog. The chase started shortly before 8:30 p.m. in South Los Angeles, according to the station. The male suspect reportedly drove the white Chevrolet Astrovan down the wrong side of a street with the vehicle's headlights turned off. At one point, the van trailed behind a police patrol car before dodging around the vehicle. CBS Los Angeles reports the driver appeared to be familiar with the area, given the way he was driving. The van raced down city streets, occasionally weaving onto sidewalks, narrowly missing other vehicles and pedestrians. It often appeared as if police were trailing the suspects, waiting for the vehicle - which had a flat tire - to give out, according to the station. After a half hour, at 9:06 p.m., the van ran over a dog. A minute later, a patrol car successfully performed a PIT maneuver, nudging the van's back bumper and forcing it to turn sideways. The vehicle was quickly surrounded by three police cars and the unidentified suspects got out and laid on the street before being taken into custody. 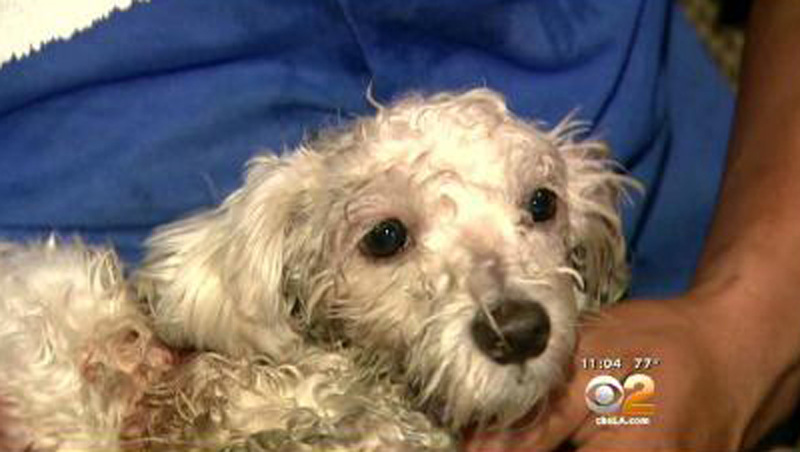 The station reports the dog, a Maltese mix named "Gordo," was taken to an animal care facility. The animal needs extensive medical care and will likely lose one of its back legs. Donations can be made online at Access Animal Hospitals.